Saudi Arabia’s Mecca attracts millions of Muslim pilgrims from across the globe every year, but this time it became a site of completely different pilgrimage. 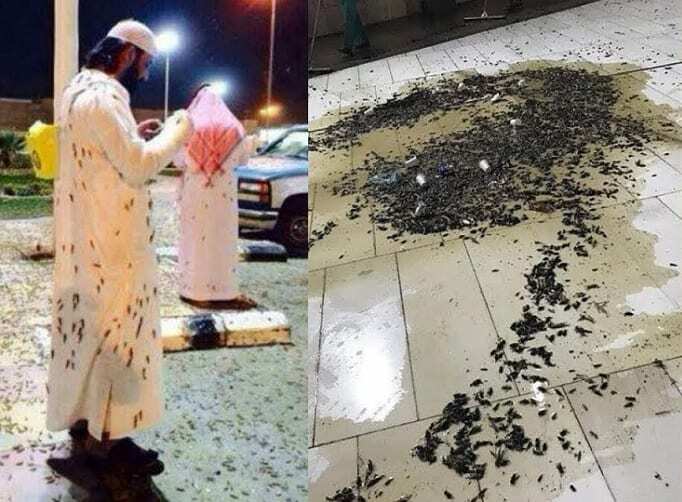 The locust have been plaguing Islam’s holiest site for a few days now, with social media relaying a detailed account of the havoc they caused. Local authorities have assigned 22 teams, each consisting of 138 people and armed with 111 pieces of specialized equipment, to curb the infestation. “We have harnessed all efforts available to speed up the eradication of the insects in the interest of the safety and comfort of guests to God’s house,” they said is a statement, cited by Al-Araby website. The masked workers were spraying insecticide in the area around the Great Mosque, paying extra attention to the locust breeding sites near open water drains. They were then seen sweeping thousands of the dead insects from the pavement. 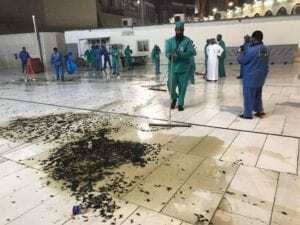 Saudi officials said that the insect invaders were identified as ‘black grasshoppers’ and that their invasive descent upon Mecca was migration-related.